Hookah- Not Just a Style Statement! Hookah, also known as Sheesha has always been a matter of style and x-factor especially among the youth. But are all of us aware of the ill effects of hookah smoking? According to the WHO, the amount of tobacco used in one hagar (the clay pot at the top) of the hookah was calculated as equivalent to about 2.5 cigarettes. · Hookah tobacco, the charcoal and the smoke contains numerous toxic substances, including tar, carbon monoxide, heavy metals and carcinogens known to cause lung and bladder disorders, clogged arteries, heart disease and oral cancers similar to cigarette smoking. · In fact, hookah smokers are exposed to more carbon monoxide and smoke than are cigarette smokers. · Hookah smoking delivers about the same amount of nicotine as cigarette smoking does, which can lead to tobacco dependence. 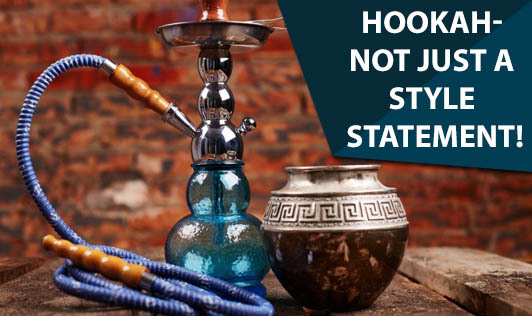 · Hookah smoke poses dangers involved with secondhand smoke. · Hookah smoking by pregnant women can result in low birth weight babies. · Hookah smoking is usually done in groups and the mouth piece is shared by all. The mouth piece may not be cleaned properly, risking the spread of infectious diseases. · Due to the frequency of puffing, depth of inhalation, and length of the smoking session, hookah smokers may absorb higher concentrations of the toxins found in cigarette smoke. · A typical 1-hour long hookah smoking session involves inhaling 100-200 times the volume of smoke inhaled from a single cigarette. Hookah or cigarettes, both are killers of health. Death surely is inevitable. But just relax and look around. There are a lot of reasons for you to live longer. Live longer for the wonderful person in you. Be wise, think wise. Enjoy life!